Current version (2.0.0) of THanoi Tower puzzle is available for download. Changes? 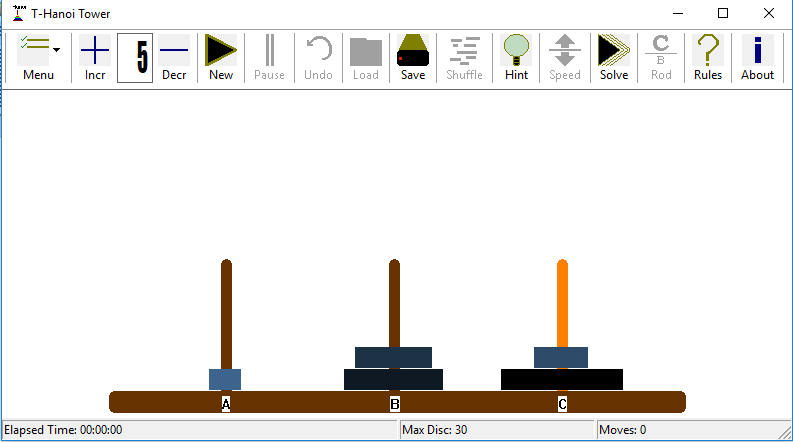 Tower of Hanoi is a mathematical game or puzzle. It is also called as Tower of Brahma that is known as “End of Universe” game. In the great temple of Brahma in Benares of India, there is a brass plate with three diamond needles under the dome that marks the center of the world. At the creation, God placed 64 discs of pure gold in the order of their sizes, from largest to smallest. This is the Tower of Brahma. When the all discs are moved from one needle to another one forming the Tower of Brahma but on a different needle, then will come the end of the universe and all will turn to dust.